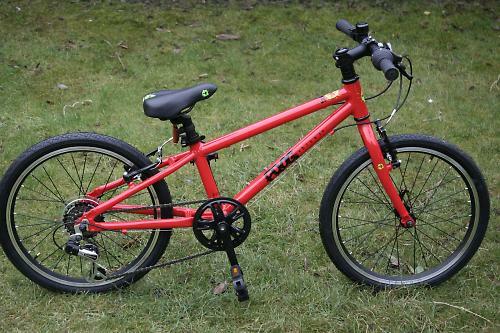 If you're looking for a good quality bike for a school-age child then the Frog 52 is well worth a look. It's light enough to be fun to ride, well-specced with sensible components and tidily built. It's not cheap, but should hold its value for when your progeny outgrows it. Frog are new to this game, and the Frog 52 is suitable for children with an inside leg of 52cm or more (that's what the number means in all their bike names) which equates to a 5-6 year old. It's built around an alloy frame and fork, and the component choices are pretty sensible across the board. The 20-inch quick-release wheels aren't overbuilt like they are on so many children's bikes and the Kenda tyres are fairly slick and suitable for traffic-free paths or the BMX track. Although they'd struggle on more technical stuff, most riding at this age is on tarmac or smooth surfaces. If you're going anywhere muddy, the Frog comes with detachable plastic mudguards which aren't the sturdiest but do the job just fine and are easy to throw on and off. 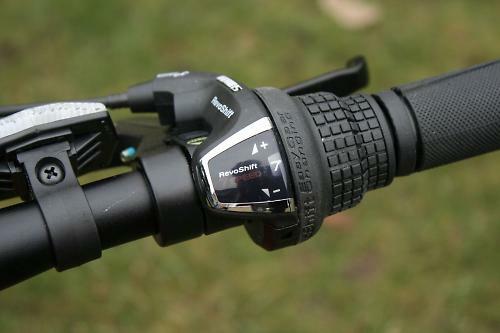 Shifting is via a Shimano Revoshift twist grip, pulling the chain over a 14-28 freewheel. With a 36-tooth chainring at the front that gives a gear range of 24 to 48 inches, which is low enough for little legs to get themselves up some decent hills. 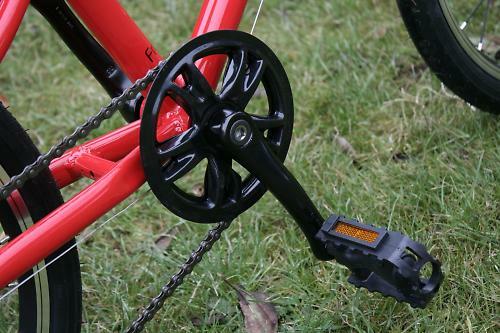 The cranks are 140mm in length. 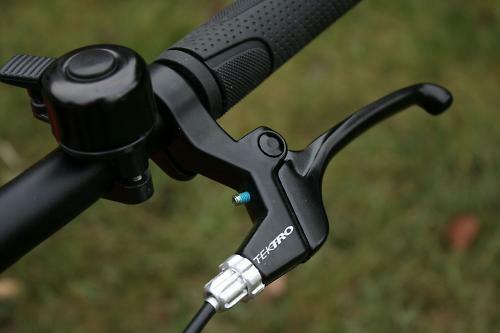 When it comes to stopping you get Tektro V-brakes and levers, with the levers adjustable for reach through a good range. Frog's own slimline grips are small enough for a child's hands to get a good handful of bar. 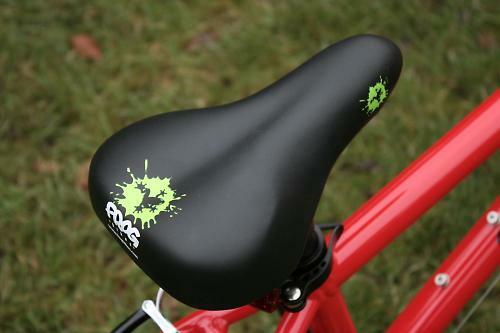 There's a child-friendly Frog-branded saddle too, and a quick release seatpost for easy adjustment. The 52 comes in four colours – orange, purple, red and polka-dot – so even the fussiest offspring should be able to find one they like the look of. The frame carries a five-year warranty. Probably the first thing anyone in the market for a £245 kids' bike will ask is: how does it compare to an Islabike? So let's dive into that one first. The comparable bike in the Islabike range is the £299 Beinn 20 Large, and that £54 of extra cash gets you a higher grade transmission and a stated weight that's around a kilo lighter. The Frog tips the scales at 8.9kg (19.6lb) which will seem like a lot to anyone that's ever bought a decent road bike, but many children's bikes weigh in at a lot more than that. Ridgeback's very decent MX20, for example, is 11.1kg (24.5lb) and that's by no means the heaviest out there; some kids' bikes come in at 12 or even 13kg. They're not fun to ride, those ones. In terms of the ride position the Islabike and the Frog are broadly similar with the Frog having a crank 13mm longer (140mm compared to 127mm). We didn't have a large Beinn 20 knocking about for a direct comparison but against the smaller-framed Beinn 20 the pedal was a bit lower at the bottom of the stroke, even though the bottom bracket was higher. The Frog was was more or less the same as the 140mm-cranked MX20. Our bike had a couple of testers along the way. Joel (5) stepped up to the Frog from a 16-inch singlespeed Ridgeback MX16 which was heavier and getting a bit small. For him the bike was a revelation and his cycling confidence grew a huge amount in a very short period of time, so much so that he was able to complete two 8-mile laps of the fairly hilly Carsington Water traffic-free trail in Derbyshire on the Frog. He needed a shove up some of the steeper hills but did the majority under his own steam, and soon got used to the shifting and braking, both of which he was very able to cope with. Louie (6) was a more confident cyclist, coming off an Islabike Beinn 20 small, and he was very happy with the Frog too. Asked which he'd prefer to keep he decided that the Frog was better for speed and the Islabike for jumping – presumably down to the shorter wheelbase and smaller frame. But ideally he'd like both: getting into the n+1 mindset early. 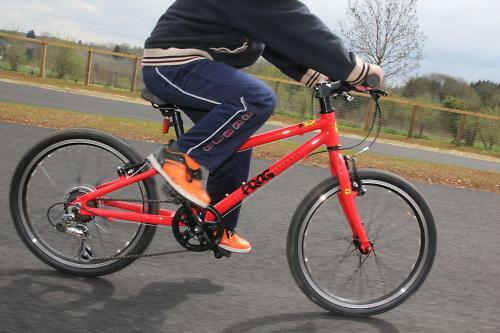 The bottom line is that the Frog is a very good bike and worth looking at if you're in the market for a new steed for your kids; the range goes up to the 26-inch-wheeled Frog 73 at £280. Is the Islabike worth the extra money? Well, the components are a bit more refined and you have to factor in that Islabikes hold their value better than pretty much anything we can think of, but the Frog is a very good bike for the money and is well worthy of consideration. If you want your child to enjoy their cycling then the minimum you'd want is a bike that's not over-heavy, with components that work and that fit them. 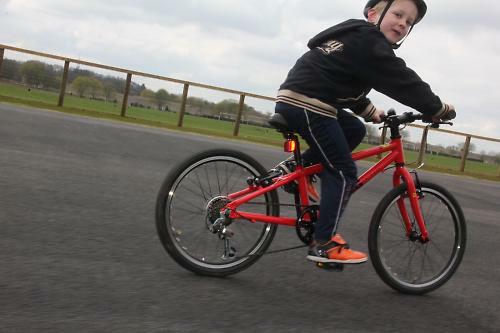 The Frog easily surpasses that minimum; it's a bike that children really enjoy riding and that's the experience that any parent wants their child to have of cycling. The Frog's built to last with good components and when the time comes to sell it on I'd expect it to hold its value very well. This great value all-aluminium bike has a high quality lightweight frame and forks and is tough enough for adventures in the woods! It has child-sized Tektro brakes with adjustable levers for smaller hands, 7-speed Shimano easy-twist gears and easily adjusted saddle height. Available in red, purple, orange or spotty, and comes with a bell, reflectors and mudguards as standard. Suitable for minimum inside leg of 52cm (around 5-6 years old). Free 5 year warranty available on the frame and forks, 2 years on all other parts. Kids love to ride it. That's pretty much all there is to say. No issues during testing and everything on the bike. Not the lightest out there but light enough to make riding fun. At the higher end of kids' bike pricing, but should sell on for a decent amount when yours have outgrown it. Well thought out bike that kids love to ride. Louie kept saying he thought the Frog was better than his Islabike for climbing - presumably due to to the longer cranks. n+1 eh... there's going to be competition for garage space in the future..
How did the kids get on with the Revoshift? My 5-year has an Isla Beinn 20 (sm) and struggles with the sram gripshift: he just doesn't have the strength to pull the mech onto the lower gears. My daughter aged 8 has had a Frog 69 for three weeks. She's so delighted with it that from being a reluctant cyclist she's now demanding to be taken out whenever it's not raining. The lightness of the overall package is very impressive. She's long and thin but not very strong and with surprisingly small hands given the size of her feet but finds the Revoshift easy to use. I went for a Frog over an Islabike as I could take her to a local bike shop that stocked them to see how it fitted (I'd originally expected to buy the next size down - the Frog 62). We're all pleased. Louie's found his SRAM gripshift difficult to shift up into the lower gears for a long time, but is now fine with it. He didn't have a problem with either. After much deliberation we just bought one of these for my daughter for Christmas in relatively gender neutral purple in the hope it can passed down to her little brother in a few years. First impressions are good, it looks nice and reasonably well made. Weight is OK and the brakes are light to pull and seem effective. Rear wheel is a bit out of true straight out of the box which is disappointing but I can probably straighten it up a bit. Will update once the bike has been received and hopefully ridden, fingers crossed it goes down well. This model of frog bike is great for the kids if you want to browse the whole collection of frog bike and buy at the discounted rate, so you can visit frogbikes.com. Here you can also get bicycle accessories that are must for safe riding.